This is from Temple 7e's shop. They have Boba Fett too. And lots of other great Kokeshi dolls that my bookshelf wants. My bookshelf is very persuasive. I should get some of these and hang myself. J: You just don't appreciate real art. You're probably someone who would have a bag of hair sitting on your counter or a child's picnic table in the middle of your living room...Oh wait. S: Great minds think alike! Thank you for the kind words! 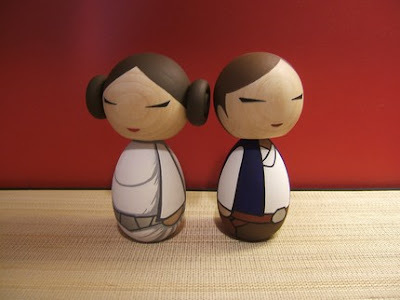 I love these, and I'm not even a Star Wars geek! The detail in the painting is extraordinary. Super cute Etsy find! Thanks for visiting my blog - I'm glad you like the song and the photo!